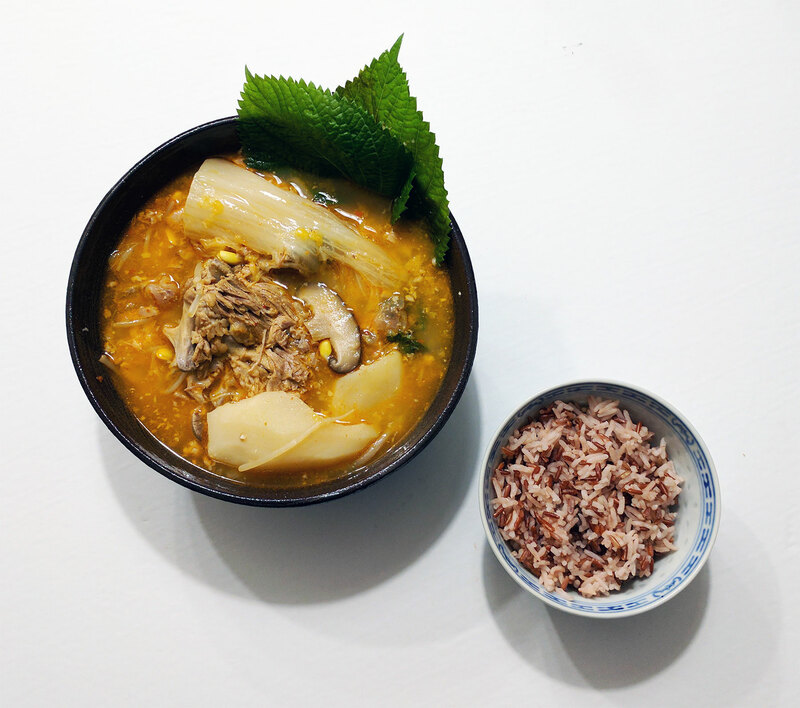 Pork bone soup, or Gamjatang, is a Korean stew made with pork bones, potatoes, and vegetables. Living in Toronto, the Korean food scene is constantly growing and there are many great restaurants that serve pork bone soup. It’s one of my favourite dishes to come home to after travelling; it’s warm, comforting and not too heavy. 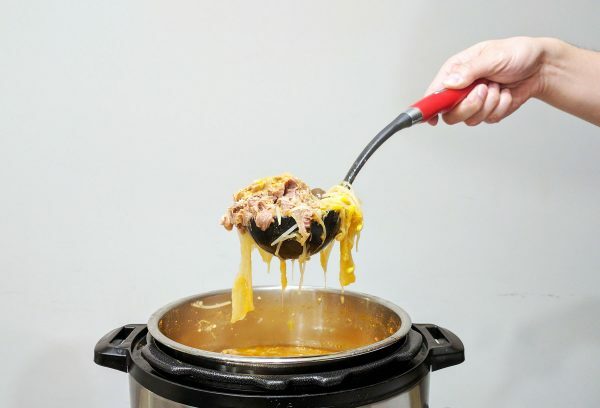 The hubby bought an Instant Pot during last year’s Black Friday sale, even though I was completely against the idea of buying another appliance that wouldn’t fit on our limited counter space. But good thing he still did, because I’m completely in love with it and barely even turn on my stove anymore! 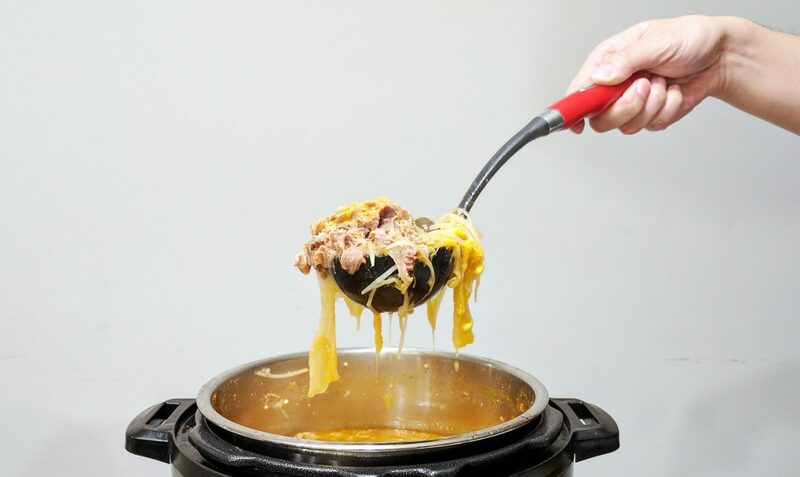 What the Instant Pot does well (among many other things) is that it can bring out strong flavours as if you’ve cooked it for hours. It’s definitely motivated me to cook things that I would normally have never tried to attempt! Pork bone soup is the perfect example of this. I wasn’t able to find an Instant Pot recipe for Gamjatang but adapted it from Maangchi.com. Let’s get this pork bone soup going! 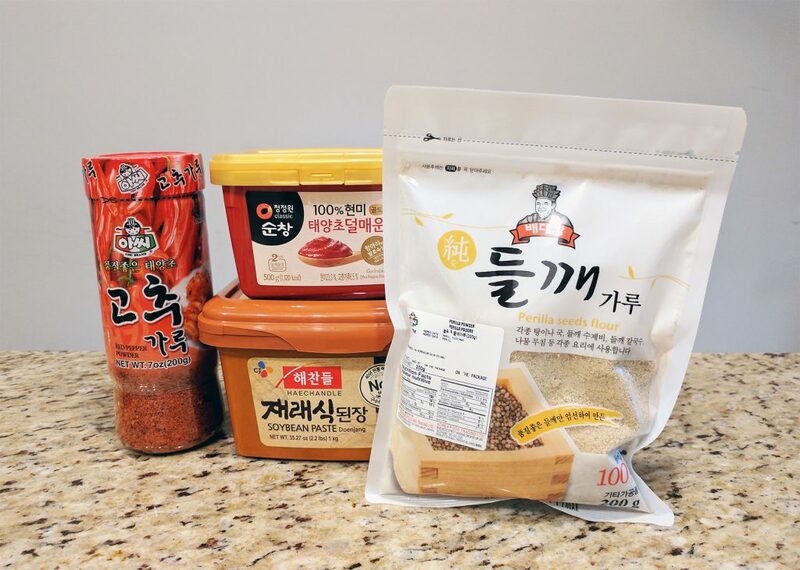 I picked up these ingredients from a Korean grocery store – gochugaru (hot pepper flakes), gochujang (hot pepper paste), doenjang (soybean paste), deulkkae-garu (perilla seeds flour), and perilla leaves (not in photo). Note that the hot pepper flakes may come in powder form – don’t buy the powdered version, but the one where the peppers are in flakes/chunks instead. To prepare the pork bones, soak them in cold water to draw out the blood. It’s best to soak them over a few hours with water changes, but a minimum of 30 mins will do. 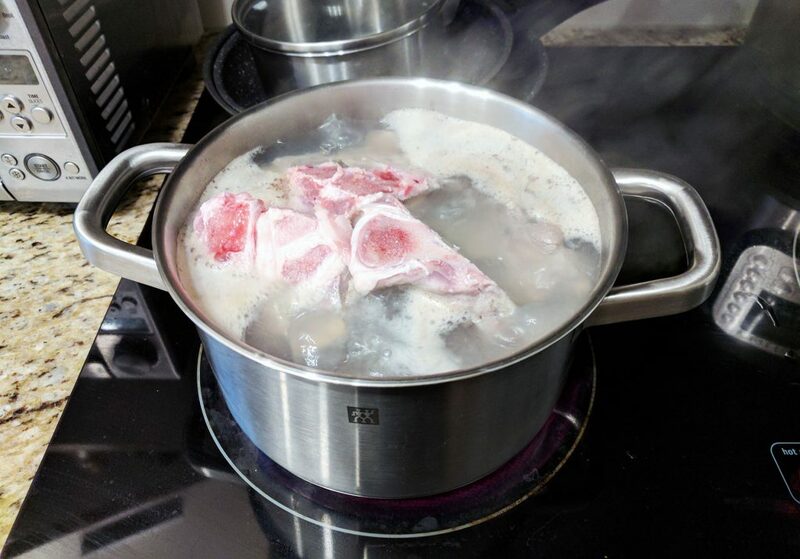 Blanch the pork bones by boiling them in water for 7 mins. Drain the bones and rinse each one under cold water. Place the cleaned bones into the pot, and add ginger, soybean paste, shitake mushrooms, onion, dried chili flakes, and enough water to cover the bones (about 6 cups). Cook on Manual at high pressure for 30 mins, then 20 min natural release. 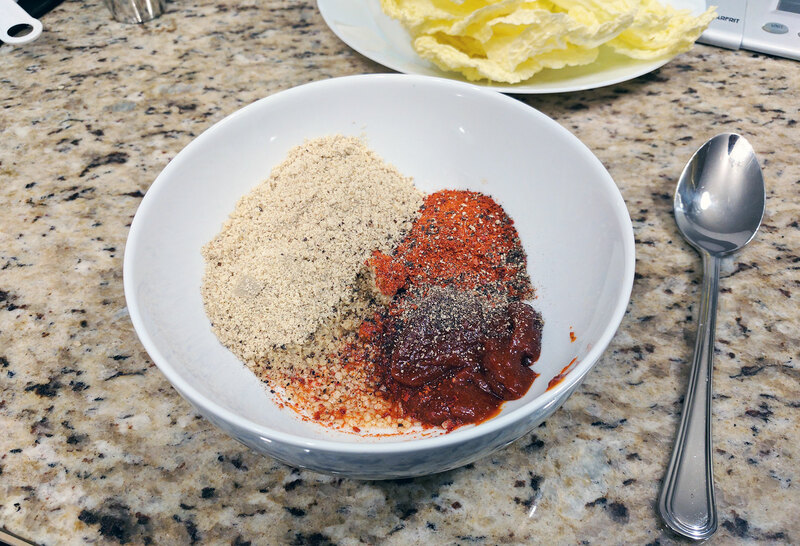 While the broth is cooking, combine the ingredients for the seasoning paste: garlic, hot pepper flakes, hot pepper paste, fish sauce, perilla seeds flour, ground black pepper, and 1/4 cup water. Stir to combine. When the broth is almost done, peel the potatoes, wash the perilla leaves, bean sprouts, green onions and napa cabbage. Cut the cabbage in half lengthwise. Chop the onions in 2-3 inch pieces, with some diced for garnish. Once the broth is done, remove the shitake mushrooms and slice thinly. Return back to the pot and add the potatoes, bean sprouts, napa cabbage, green onions, and the seasoning paste. Cook on Manual at high pressure for 5 mins, then quick release. Add the perilla leaves and stir. Serve the soup into bowls and garnish with chopped green onions. The meat comes out literally fall off the bone and the broth has the perfect amount of kick. If you like your pork bone soup extra spicy, you can try doubling the seasoning paste. Let me know how your gamjatang turned out in the comments below! Soak pork bones for a minimum of 30 mins. 3-4 hours is recommended with a few water changes. Bring a pot of water to a boil. Blanch the pork bones for 7 minutes. Strain the bones and rinse each bone under cold water. 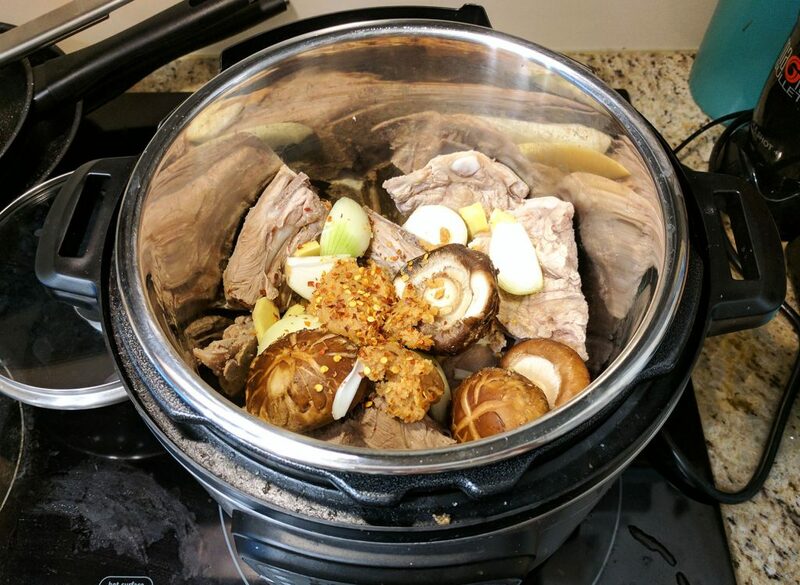 Place the bones into the Instant Pot. Add in ginger, Korean soybean paste, shitake mushrooms, onion, dried chili flakes, and water until ingredients are just covered (about 6 cups). Pressure cook on Manual at high pressure for 30 minutes. Natural release for 20 minutes. While the broth is cooking, make the seasoning paste. Combine garlic, Korean hot pepper flakes, Korean hot pepper paste, fish sauce, perilla seeds flour, ground black pepper and 1/4 cup water. Stir to combine. Once the broth is done, remove the shitake mushrooms and slice thinly. Return mushrooms to the pot, and add potatoes, bean sprouts, napa cabbage, green onions and the seasoning paste. Pressure cook on Manual at high pressure for 5 minutes. Immediately quick release. Add the perilla leaves and stir. Serve with chopped green onion as garnish. Thanks Daniel 🙂 Glad you enjoyed it!